Description: This impressive Kwakiutl Raven clacker mask is made of carved cedar and is painted in Traditional Kwakiutl colours of green and earth red. Mask is 28"x10"x40". There is a small wooden white skull that fits into the top of the raven's mask and there is also art work painted on the underside of the long 28" clacking beak. The long 40" braided cedar bark would go done over the dancer's head, shoulders, and back as he wore the mask on his head bobbing the raven up and down in the hair. 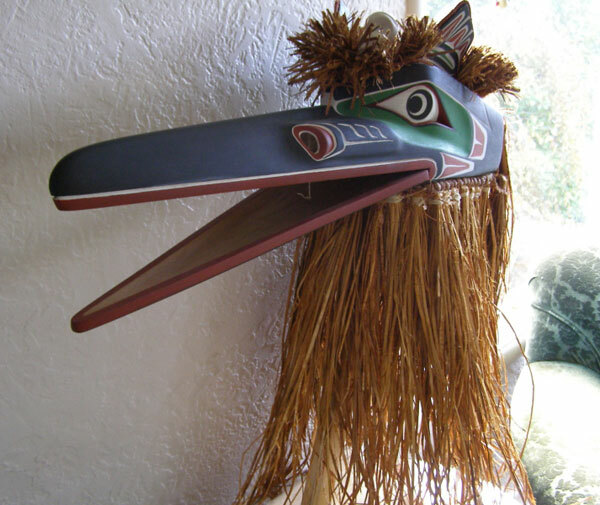 The dancer would pull a string in the beak to make the beak clack together to make a loud sound during the ceremony. See our blog for a photograph of this Kwakiutl Ceremony. Mask is signed and titled in pencil inside the head by James Leslie. It comes on a stand but can equally hang on a hook on the wall. A very powerful work!